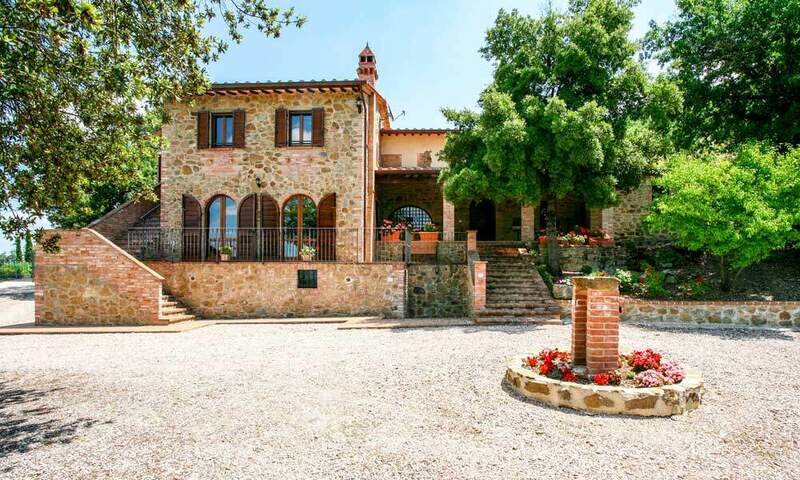 This lovely restored farmhouse is located not far from Bevagna, one of the most sought for locations in region Umbria. 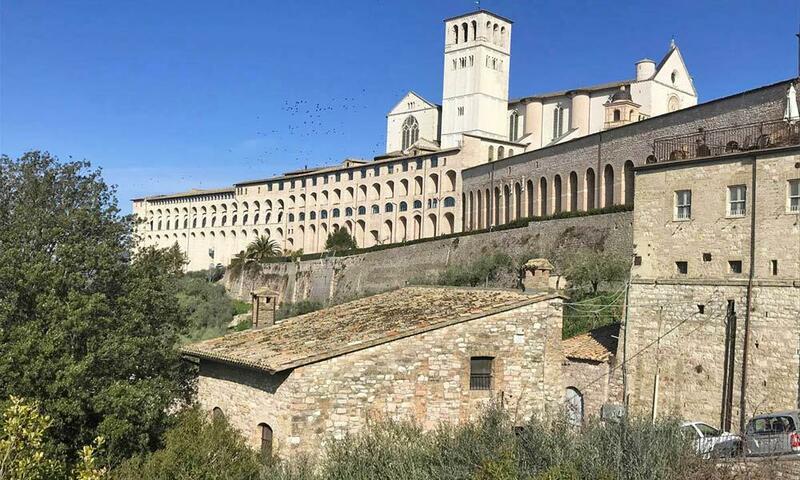 The house enjoys a privileged position, surrounded by olive trees and with a stunning view of Assisi to the north, while the 10th Cent. old castle is visible from the house’s windows and garden. One of the peculiarities of this house is that it is “upside down”: it develops with the living area on the top floor, while the bedrooms are on the lower floor, in order to follow the natural profile of the hill on which it stands. The house is the result of a careful restoration of an original, old building at the feet of the castle. It measures about 365 sq.m. on 4 floors and it is accessible from several levels. You can access the top floor from the main entrance to the property, which features a gate. From here, you enter the living area directly, with a modern and cozy living room, with direct exit out to the garden and a small paved terrace with pergola. Here you can enjoy an aperitif in the shade, while admiring Monte Subasio and beautiful Assisi, which stands on its slopes. On the same floor, separated but directly connected to the living room, there are the kitchen and dining room, with direct exit out to the garden via a French door. The choice of separating the two rooms through a white wall without doors makes the rooms totally independent. At the same time it allows light and air to circulate, making the rooms healthier, bright and easily accessible. On the same floor there is also a guest bathroom, as well as a studio/reading room. Stepping down a grey, stone staircase, which creates a lovely contrast with the white and stone walls, you can reach the first floor, where several areas were created during the restoration and that may be kept as they are or rearranged. At the moment – completely separate and independent – there is a master bedroom as you step down to the right. It is composed of a very spacious bedroom, with big step in closet and private bathroom. From all windows you can enjoy a lovely view over the countryside, Monte Subasio and Assisi. On the opposite side there is another independent area, with small kitchen, 2 double bedrooms (one with exit out to a balcony) and a bathroom. This space could be used as an independent studio-apartment for your guests, for the in-laws or to be rented out to get a small income. In the last event, everybody would enjoy full privacy, as the apartment enjoys an independent entrance from an external staircase connected to the balcony. On the other hand, this small apartment could be turned into additional bedrooms, especially if you have a big family with kids. On the ground floor there’s the most peculiar part of the house: a 2,5×13,5m heated swimming pool. This way you can swim both in the summer and in the winter and it’s good especially for your kids or grandchildren, who will have fun all year around. Two French doors will allow fresh air and sun get into the room in the summer. You may place a few sunbeds in the garden, so you can swim and get out for a sunbath. On this floor there are already all the settings to make an additional bathroom. The basement is used as a very spacious storage. The house is yearly maintained, and features many quality finishes as ventilated roof, wood windows and shutters, mosquito nets (always very useful during the Italian summer!) and security railings. One of the major pluses of this property is that, despite its location close to the village and the infrastructures, it is surrounded by a good quantity of land: almost 1 hectare, including an olive grove, that will allow you to produce good quality olive oil for your own consumption. The size of the land is also essential to ensure privacy, silence and peace. From the land there are 2 entrances to the property: the first one is very comfortable, via a paved, municipal road, which connects directly to the driveway of the house. The second entrance instead is from the borgo and you get to the property along a small road of about 100 meters. In the area where the house stands, traces of a Roman pagus (agricultural settlement) have been found, with an aqueduct, funerary inscriptions and the remains of a pagan temple. The village – as we see it today – was born in the 10th century, under the aegis of Bevagna. After a few years of neglect, the village-castle in recent years has been completely renovated and now houses a well-known restaurant in the area and a high-end accommodation facility. The history of the borgo, together with this rediscovered tourist charm, make the village and its surroundings a lively area, but never too crowded. The nearest and best known city is Bevagna: another beautiful medieval town built on the ruins of a Roman amphitheater. The town is full of typical restaurants, taverns, bars and in its wonderful square you can sit down and enjoy an ice cream. Every year in Bevagna a fascinating medieval historical re-enactment is carried out, where the inhabitants of the town – in medieval tunic costumes – stage the old arts and crafts. 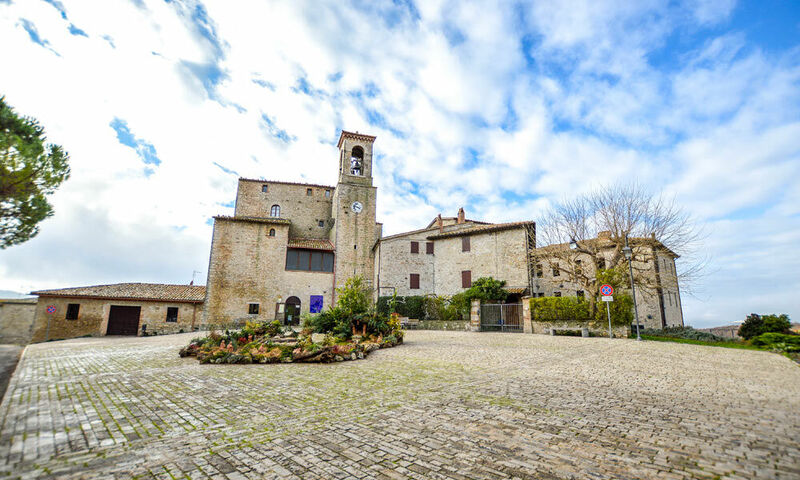 Nearby there are also other beautiful towns as Montefalco, Cannara, Spello and above all famous Assisi, which is also visible from the property. The house is an excellent property for those who want to live surrounded by nature, enjoying a large garden and the joyousness of the land, without giving up your social life. In this sense, it is perfect for a family that wants to grow their children in Italy in contact with nature, but with all services not too far from home. Even reaching the sea, thanks to the new SS77 is a matter of a moment: in about an hour’s drive you can reach the beautiful beaches of the Adriatic coast. The house is also excellent as a place to retire: here you can enjoy the tranquility of the countryside without renouncing social life.